Last month—and particularly last week— Seattle foodies were downcast as the blows kept coming: Queen Anne’s Grub closed February 15. Pioneer Square’s Little Uncle shut down February 25. Shanik’s Meeru Dhalwala announced that it will close March 21. Renée Erickson’s Boat Street Café will shutter May 30 after 17 years with her at the helm (though, praise be, original owner Susan Kaplan will expand her neighboring Boat Street Kitchen into the space and continue serving the Boat Street paté, the amaretto bread pudding with butter rum cream sauce and other favorites). Furthermore, less than a week after he was named a James Beard Semifinalist (Best Chef: Northwest) for his work at northern Italian restaurant Spinasse, Jason Stratton announced he would be stepping down from that restaurant and his others—Artusi and Vespolina—immediately to head to Spain. What the #*%&$* is going on? A variety of things, probably—and a good chance there is more change to come. First, some old-timers report they’re simply ready for a change. Both Erickson (also of The Whale Wins, The Walrus and the Carpenter, Barnacle and two new upcoming projects on Capitol Hill) and Stratton have had their hands in many pies for some time, and they say it’s time to narrow focus on their other restaurants (Erickson) or to take a break and regroup (Stratton, after seven years at Spinasse). “That’s a long time to put in anywhere,” Stratton told Eater. Next, even great-tasting restaurants battle tough odds—especially new ones (Shanik and Pioneer Square’s Little Uncle location both reached two years; Grub reached two and a half). The National Restaurant Association doesn’t have exact failure rates for restaurants in their first few years, but media relations and public affairs director Christin Fernandez reports that according to census data, about 60,000 restaurants open and about 50,000 restaurants close in an average year. Statewide, Anthony Anton, president and CEO of Washington Restaurant Association and anti-minimum wage lobbyist, says that each year in Washington, 17 percent of restaurants go out of business or change hands. In Seattle, with approximately 2,300 restaurants, that translates to approximately 400 closures or sells expected—“in a good year,” Anton says. Why do restaurants close? According to Fernandez, there are many reasons "from ownership changes and concept switches, to operational cost increases and failure to thrive.” Last July Komo’s Naomi Tomky named location as its first of six reasons why “awesome restaurants close”—which Shanik chef-owner Meeru Dhalwala and Little Uncle proprietors Wiley Frank and Poncharee Kounpungchart have both told devotees is their main reason for shutting. In Shanik’s case, South Lake Union requires a much more substantial bar presence and more casual overall atmosphere, Dhalwala (of Vij’s and Rangoli in Vancouver) has learned, than the Vij’s-inspired elegant Indian dining house she built. As for Little Uncle (which has reopened its Madison Avenue takeout window since the Pioneer Square restaurant closed), Frank and Kounpungchart originally expanded to their basement space on Yesler to extend their menu and host gatherings, but ultimately learned that “bigger is not better. We have come to the conclusion that the Pioneer Square location ultimately does not fit into the goals of our professional life and personal life. Passing the Pioneer Square location on will give us the opportunity to refocus and find a better way to build Little Uncle,” they told Eater. And for Seattle restaurateurs recently, there is also another key consideration. Though none of our local departing/transitioning restaurateurs who announced their plans last month have mentioned this as an issue*, another major factor affecting restaurant futures in our city is the impending minimum wage hike to $15 per hour. Starting April 1, all businesses must begin to phase in the wage increase: Small employers have seven years to pay all employees at least $15 hourly; large employers (with 500 or more employees) have three. He estimates that a common budget breakdown among sustaining Seattle restaurants so far has been the following: 36 percent of funds are devoted to labor, 30 percent to food costs and 30 percent go to everything else (all other operational costs). The remaining 4 percent has been the profit margin, and as a result, in a $700,000 restaurant, he estimates that the average restauranteur in Seattle has been making $28,000 a year. With the minimum wage spike, however, he says that if restaurant owners made no changes, the labor cost in quick service restaurants would rise to 42 percent and in full service restaurants to 47 percent. Despite these serious challenges, however, brave restaurateurs continue to open eateries in Seattle, which, remembering basic supply and demand, also naturally accounts for closures we’ve already seen and more that will come. Capitol Hill alone is carrying on an unprecedented dining boom, and in mid January, Capitol Hill Seattle announced that Nue, Chris Cvetkovich’s modernist global street food joint, was the neighborhood’s 100th food and drink opening in three years. Other major Capitol Hill additions from the last few months include Stateside, (Eric Johnson’s long-awaited French-Vietnamese outpost), Tallulah’s (Linda Derschang’s [of Smith and Oddfellows] casual neighborhood café) and Serious Pie Pike (Tom Douglas’s third location of his pizza joint, now open in the new Starbucks Roastery). Moreover, just this week on the Hill, we’ve got news of Lisa Nakamura opening the Gnocchi Bar in the Packard Building on 12th Avenue (formerly the Capitol Hill D’Ambrosio Gelateria Artigianale) at the end of March. 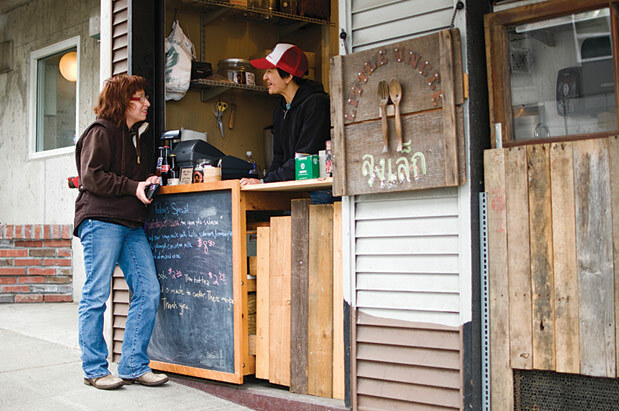 How to keep these and our other favorite culinary havens in business? With the wage hike around the corner, the imperative seems to have reached a new urgency: dine out.